Last night, Jason Taylor Martinez, rusty blood sufferer, posted an update on his GoFundMe fundraiser page. 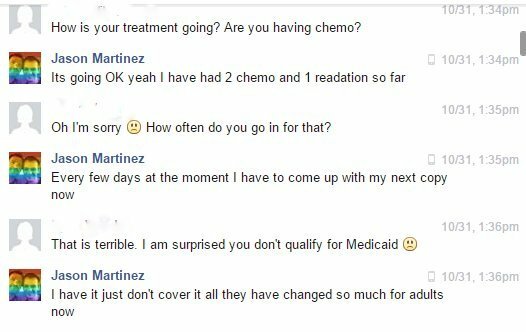 He also sent me a message claiming that he never said he had Medicaid and insisting that he has Medicare. Two days ago, I specifically asked Jason why he didn’t qualify for Medicare. This was the answer I received. In the original text of his GoFundMe page, Julian claimed that Jason had no insurance at all. This was pointed out in the comments of the 7000 member closed Facebook group that Julian made to call attention to Jason’s plight. Incidentally, even if Jason is on Medicare, there’s no way he’d have a $2000 copay at each of his chemotherapy appointments. At most, he’d be responsible for 20% of the costs of chemotherapy, and there are supplemental insurance programs that he’d be eligible to join where the costs not covered by Medicare would be covered. Jason and Julian have seven Fundly pages set up to raise money for Jason’s cancer treatment. Granted, all of them have a goal of $45 total, so the sheer number of them might be an accident. There is also a German language fundraiser set up for the couple, although it has no donors. As of now, the GoFundMe fundraiser, which had been shared on Facebook over 15,000 times as of yesterday, is still active. I’d encourage anyone who donated to the fundraiser to contact GoFundMe and voice your concerns. Just in case it’s deleted, here’s a saved copy of the GoFundMe. Here is a saved list of all the donors– note how many of them say how little they have but how much they feel compelled to help Jason and Julian. Here’s a copy of the couple’s attempts to raise money for a car. And here are screenshots of the Facebook group set up to raise awareness for their fundraisers. A new collage was posted yesterday. Unless he has been on social security disability for two full years, he does not have Medicare. However, a man in his situation would be eligible for Medicaid in all 50 states. Medicaid would not have large co-pays. I’m glad to see you back to blogging! Just a note, on your third screenshot the sentence before references Medicare when the conversation references Medicaid. Maybe I’m reading it wrong, but just letting know about the little stumble. Have you not seen many cancer patients? While his story is pretty obviously faked by someone who hasn’t done a ton of research into cancer, it does all of us a disservice to assume someone with cancer looks any particular way. That was how I ended up with nasty notes on my windshield and even getting my car keyed when I used a handicapped placard during treatment: I looked like I had all of my hair (I had to cut it very short early on in treatment but even after 6 months of chemo other people couldn’t really tell how much it had thinned), I gained 65+ pounds, and was in my early 20s. People thought I was healthy based on how I looked, even though I was dealing with stage IV cancer and the side effects of treatment. Please don’t assume that you must be pale, gaunt, and bald to be going through chemo! That is a REALLY impressive run-on sentence on the GoFundMe update. Maybe instead of cancer, he should raise money for an English class. One of the things on the GofundMe page is that there isn’t transportation to chemo. At least in my state Medicaid will help provide transportation for medical treatment and I’m fairly sure that’s pretty true everywhere. It might be interesting to ask about the source of income. If he’s getting Medicare at his age he’s also getting SSDI which is a semi-reasonable income (it’s not much but it’s enough to not have the kind of problems he is discussing). There is no way he could have Medicare without that. The average SSDI payment is about $1300/month I think. He looks kind of young to have enough credits to get SSDI though; it takes time to build that up. If he’s on SSI then he’s still getting between $700-800 (can’t remember the specifics) per month and then he automatically gets Medicaid. If you have Medicare and a low income you get Medicaid too. Even if you have Medicare and a little higher income I have something called spend-down Medicaid for just such things as chemo. I either pay them a specified amount per month that lets me qualify (or I wait untiL I’ve accumulated medical bills over the specified amount) and then they pay everything beyond that amount. So for example I have a several week hospitalization coming up. Medicare will cover it but a $1200 co-pay and 20% of the dr. fees. Once I hit my spenddown I won’t have to pay anything else that month b/c Medicaid will cover it. That repeats for any month I have a need. Jason Martinez, Julian Baker and cohort, Ina Höppner. The three of them have been working together on multiple charity sites to collect funding for bogus cancer claims. Jason and Julian have given incorrect information on the disease itself as well as conflicting information on hospitals, doctors, type of cancer, and original diagnosis. I will just lay out for everyone to see. 1. 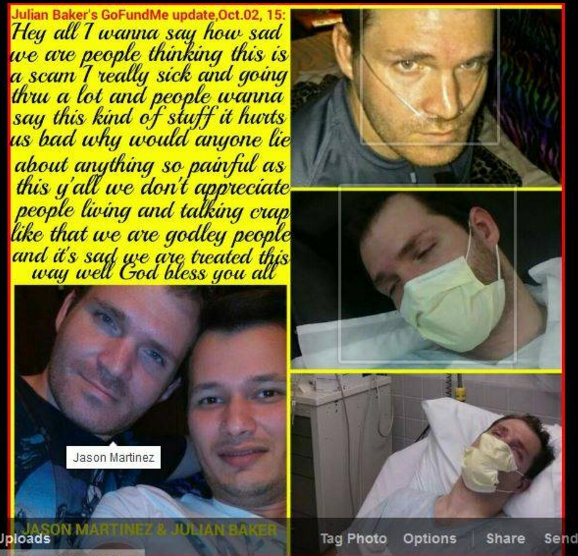 Julian Baker (The apparent advocate for Jason Martinez), claims that Jason has STAGE 4 cancer and is current awaiting a lung transplant and is on a national registry for a lung donor. The cannot be true, because if anyone has active and spreading Cancer, they are automatically removed from the potential donor’s list. 2. Julian Baker claims that Jason has had one… yes ONE chemo treatment and one radiation treatment. This is simply outrageous. When someone is set up for chemotherapy, they are set up for a series of treatments. Not one here and there, because that would obviously be inaffective. 3. Julian Baker claims they have ZERO paperwork for any doctor or any treatment of any kind. When given a cancer diagnosis, you are given paperwork, and information can easily be obtained for referrals, treatments etc. The claim they they cannot get any paperwork is ridiculous. They would simply need to call the office or the doctor. And, of course, the originally paperwork they were given, along with any sort of billing statement. 4. Cancer is a disease that kills healthy cells in the human body. Without treatment, the body will begin to waste away. Cells die as cancer feeds on them. After a period, the body begins to show signs of weight loss, loss of color etc. This does vary, obviously, but weight loss will no doubt happen when the body is riddled with Cancer. Today Julian Baker claimed that not only has Jason, gained weight, but he is actually overweight. Keep in mind this is a man that claims to have head to toe Cancer for 5 YEARS. 6. Almost one year ago, I asked Jason and Julian to post a recent photo showing Jason’s deterioration. One year later, NOT ONE PHOTO. WHY? 7. This past year Julian Baker was given lists of charities that will assist in treatment payments, transportation and other needs during this time. This was nearly one year ago. They have NOT called one single charity to ask for any assistance. WHY? 8. Why does Julian and Jason claim to have medicaid one day and the next day they forget.? 9. Prognosis for full body cancer, 1-6 months, with pain medication on a constant basis. 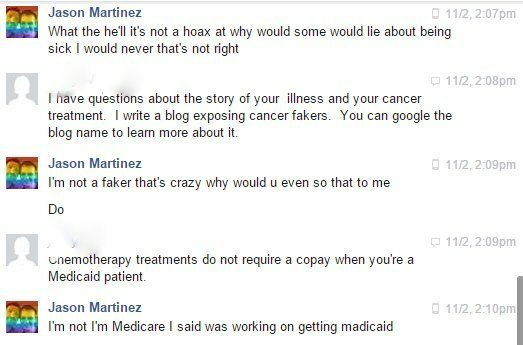 Jason Martinez is going on 5 years with NO treatment and has cancer throughout his body? How is this possible? Medical miracle or lying frauds? 10. When asked point blank, which hospital did you go to for your one chemo treatment. Jason and Julian= NO RESPONSE. WHY? I have all conversations saved as well as screen shots. When I spoke with their German friend about some of these questions, she immediately blocked me. Why? For the record, I don’t personally believe that their German friend is in on anything. I think she believes Jason is dying of cancer. Sad to hear about caring people being taken advantage of by desperate people. Would be happy to be convinced that this isn’t true.